Black-eyed peas, butternut squash, and goat cheese make the perfect fall salad in this Black-Eyed Peas Salad with Roasted Butternut Squash and Goat Cheese. When I first started cooking, if I didn’t have an ingredient in a recipe, then I didn’t make that recipe. It was a simple as that. Black and white. No grey area. Now, I freely substitute at will, usually ending up with just as good, if not better, results. 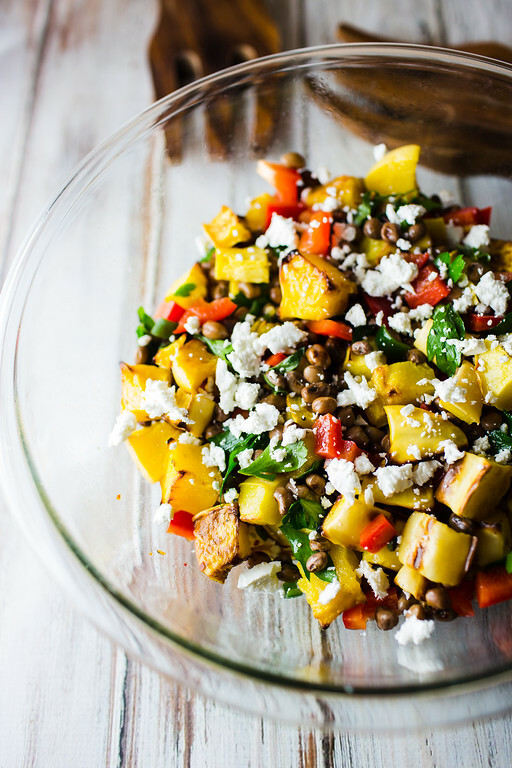 Take this Black-Eyed Peas Salad with Roasted Butternut Squash and Goat Cheese pictured above. It doesn’t contain black-eyed peas or butternut squash. Then why I am calling it that? Because that’s the name it’s given in Fresh Every Day: More Great Recipes from Foster’s Market by Sara Foster, and if you have black-eyed peas and butternut squash, you definitely need to make this salad! 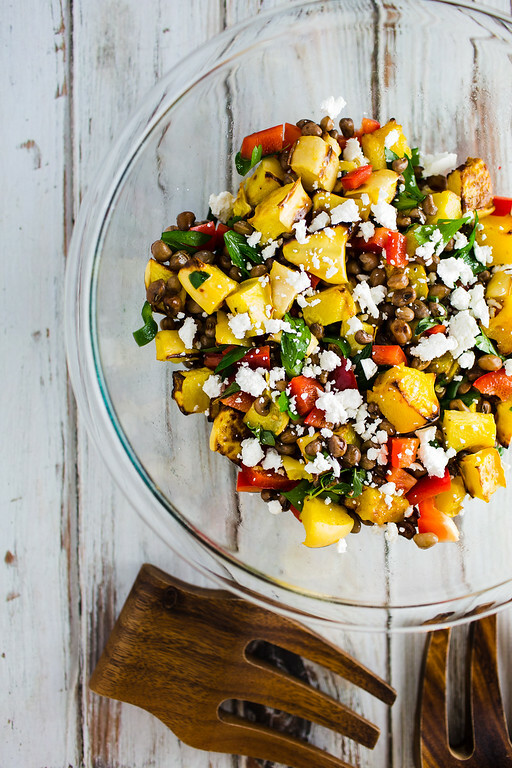 Click here to pin this Black-Eyed Peas Salad with Roasted Butternut Squash and Goat Cheese now! When my CSA gave me fresh crowder peas, I immediately went searching through my vast cookbook collection for recipes using crowder peas. There wasn’t much. After googling crowder peas, I found out that they were in the same family as black-eyed peas – and as a whole group are commonly referred to as Southern peas or cowpeas. Ah, this I could do. I remembered a black-eyed peas salad that I had seen in a Sara Foster book. Oh boo, it called for butternut squash, which I didn’t have. But I did have acorn squash. Perfect! So my Black-eyed Peas Salad with Roasted Butternut Squash and Goat Cheese is really Crowder Peas Salad with Roasted Acorn Squash and Goat Cheese. That’s the beauty of this salad, any kind of bean really will work, though I am partial to those with an eye. Any kind of roasted winter squash will work. It called for fresh marjoram, which I didn’t have, so I used fresh oregano. The salad makes plenty of the sweet and spicy vinaigrette, so you will love using it on your salads for the rest of the week! This Black-Eyed Peas Salad with Roasted Butternut Squash and Goat Cheese is the perfect fall salad! Place the squash on a rimmed baking sheet. Toss with the olive oil, season with salt and pepper and spread out in a single layer. Roast for 30-35 minutes, until the edges are brown and it is tender when pierced with a fork. 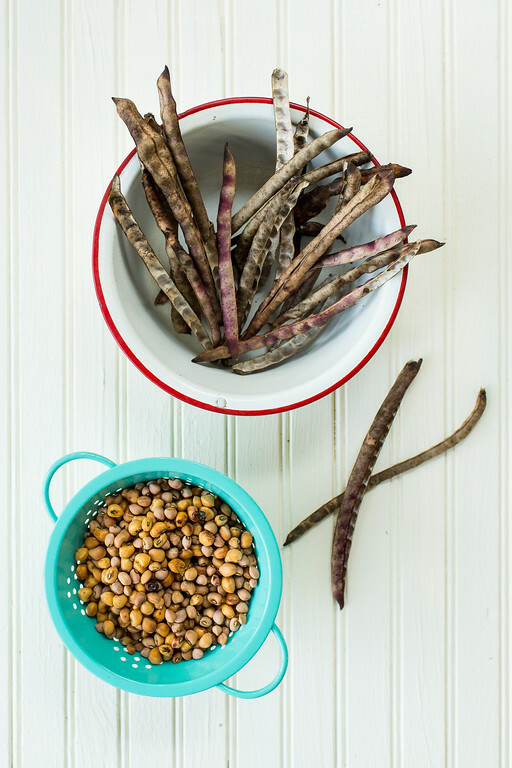 Place the black-eyes peas in a pan and cover with water by 3 inches. Salt and bring to a boil over high heat. Reduce the heat to simmer and cook for 20 more minutes, stirring occasionally. The peas should be tender, but still firm. Drain and rinse under cold water. Place the ingredients for the sweet and spicy vinaigrette in a mason jar and cover with a lid. Shake to emulsify. Place the squash, peas, bell pepper, jalapeno pepper, marjoram, parsley, salt and pepper, and 1/2 cup of the vinaigrette and toss gently. Transfer to a serving platter and top with the crumbled goat cheese. Oh I love the Foster’s Market Books! I really like this recipe, Pam. It looks so beautiful and colourful, and oh so tasty too. Thank you so much for sharing and for being a part of Hearth and Soul. Hope to ‘see’ you again this week! You have hit the Jack Pot with this salad. We grow Black Eyed Peas and Butternut Squash, what a great combination for this beautiful salad! Thanks so much for sharing with us at Full Plate Thursday,we are so happy to have you join us. Have a wonderful week and come back to see us real soon! Could you substitute chick peas? I’ve never seen black-eyed peas here. Are they soft or crunchy? Black-eyed peas are soft. They have a very unique flavor. Oh yummy. I would love this very much. I love the freshness of this and the pumpkin sounds divine! Yum! Looks wonderful. I am a big fan of substitutions too. o, how good this all looks…. I substitute all the time when I am cooking. Baking is another story…I’m not quite as confident there! Your salad looks perfect for fall…can’t wait till we start seeing butternut squash at the farmer’s market! I love beans in my salad. I’ve never heard of crowder peas and have never used black eyed peas. That’s gonna change! Thanks for linking up at @SaucySaturdays. I love black eye peas and I think crowder peas are even better. Somewhat more firm and a more mild flavor I think. I recently discovered acorn squash and butternut squash. I love to slice them, put some seasoning, sprinkle some olive oil and bake them. Sometimes I add grated parmesan towards the end. Delicious! The only problem is they are very hard to cut. I almost broke a knife. Does anyone have any tips? I couldn’t find anything helpful online. Butternut squash…acorn squash…I use them interchangeably! They taste so similar, who will know the difference. This is beautiful…and I need it. This looks and sounds amazing!!! With any squash! Even pumpkin!